Here’s another 7400 entry, BrainF**k machine. 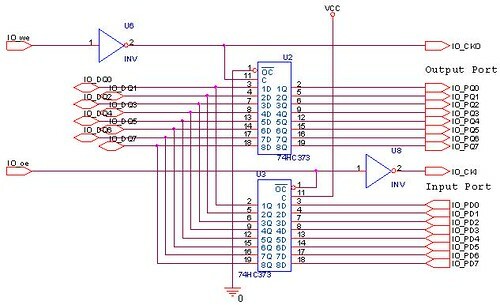 This is a home brew 8bit CPU with 8 instructions, supporting the BrainF**k esoteric programing language. 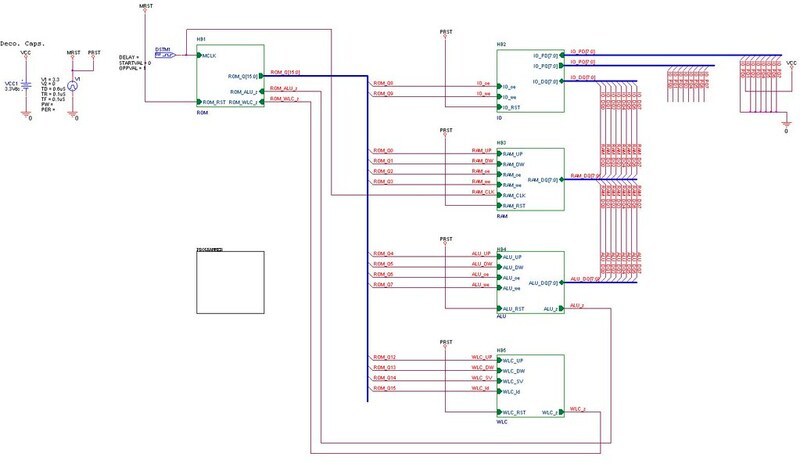 It is possible to design a relatively powerful processor with a very small amount of logic circuitry, provided that the architecture and the instructions are carefully built for a concrete application. 74 logic circuits are still very useful today, new families with better parameters come out, old circuits are removed and new ones added. 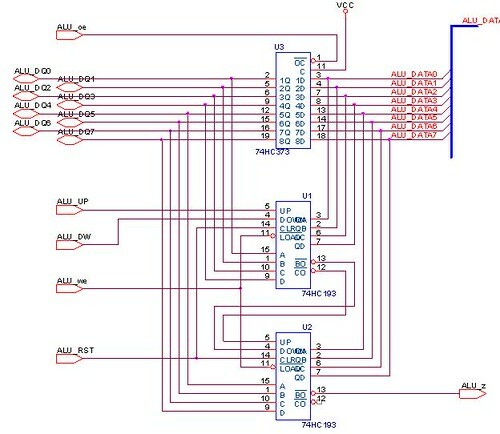 Thanks to this project, I learned a lot about CPU design, logic circuits and logic simulation. I hope it will inspire other projects. This entry was posted on Saturday, November 3rd, 2012 at 1:00 am	and is filed under 7400 contest, contest. You can follow any responses to this entry through the RSS 2.0 feed. You can skip to the end and leave a response. Pinging is currently not allowed. The link to the entry itself is missing; both links at the start of this post refer to the same Wikipedia article. Here is a link to my article ^, please correct it. 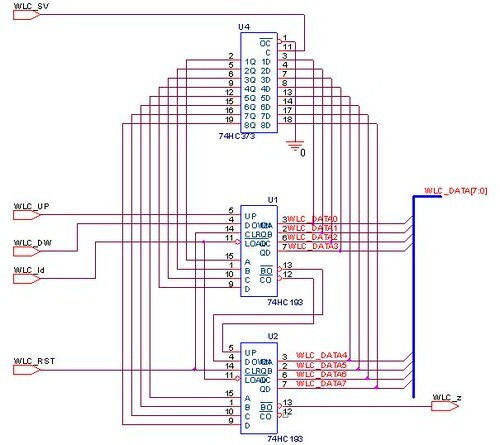 I had builded a 74xx based brainf**k cpu years ago, but the project only contains orcad schematic and VHDL simulations. 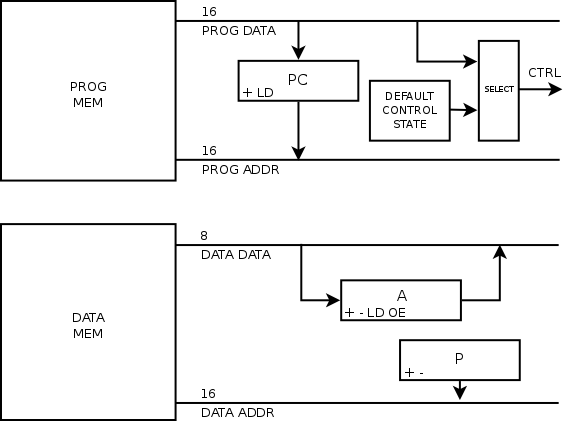 The main sch is divided into 5 blocks: rom, ram, alu, io and wlc (while loop counter). For each bf instruction, program in rom contains up to 4 micro instructions used to execute these bf instruction.